A Trap Sprung To Force A Marriage. With that he started to knead his fingers and a plan was quickly formulated. Lord Chou was indeed very pleased and bestowed a feast for matchmaker Chiang before giving her two hundred taels of silver. 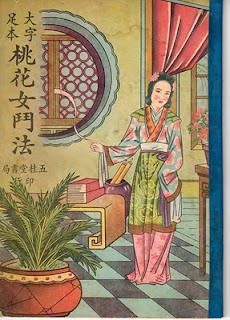 Matchmaker Chiang who was happy as a lark, bid farewell and returned to her home. Hsu Cheng knew what she was hinting at and quickly left with her. Alone, Tai Kung sat in a daze for an hour. No matter how he thought, his heart was filled with joy - imagining all the advantages that go hand-in-hand when married to nobility. Alas he forgot all the disadvantages as well. He walked joyously into the inner apartments. She then proceeded to explain how Lord Chou’s representatives came with a marriage proposal and that her father had agreed that she is to be married on the nineteenth of the month. Peach Blossom did not wait for the words to finish. Her face grew ashen and cried out “Aiyah” before falling off her chair. Not knowing how Peach Blossom’s life fares or whether the marriage takes place or not, please continue to the next chapter. 1. The original text did not specify what beast it was but I assumed that it was a mule or an onager since it was a common transport in old China. 2. In Chinese society and to a certain extent today, all deals are made over a cup of tea. Tea prominently figures in all ceremonies. Here in this context, it means a marriage has been sealed. 3. On a happy occasion such as marriage, it is expected that some of the goodies be spread around to neighbours, good friends and for anyone happening to pass by as a sign of good luck. More probably so for gossiping and showing off good fortunes. 4. Girls are expected never to leave the inner apartments of their home and are not seen by outsiders. The day she leaves the inner apartments is the day of her marriage. Of course in practice, girls are just human beings and they do tend to sneak out in incognito, sometimes even dressed up as a man. 5. In the end, no matter how rich one is, when it comes to giving money, everyone is more than happy not to give out any so would happily agree to the marriage proposal..
6. In a Chinese marriage, the couple must first bow to Heaven and Earth to show their respect for life. The second bow is before the parents to thank them for giving them life and finally to each other as a respect between man and woman. In those days, most marriages are prearranged and there is no such thing as love. They need to learn how to love one another after marriage! In the absence of parents or a formal setting, a couple may forego all associated rites except for the bow to Heaven and Earth which will then act as witnesses. Such an action constitutes a binding contract between the couple. 7. On the 3rd day of the marriage, the wife returns to her parent’s home, if she has one, as she is no longer free to leave the husband’s family whenever she wishes. Her husband’s family becomes her family. When she dies, she is buried in the ancestral temple of her husband not that of her family’s. Of course nowadays there is no such restriction for her. However the custom of returning on the 3rd is still very much observed because of all the associated parties on the wife’s side of relations.